This Christmas just gone, Mum surprised me with this wonderful bumble bee stationery from Wagtail Designs. She thought it would be perfect as it matches the bee wax seal I have. I’ve received some great feedback from penpals and as it’s International Correspondence Month (InCoWriMo) I thought it would be the perfect time to share it with you. The writing paper is a lovely 120gsm ivory (cream) paper in A5 size with the bumble bee illustration printed at the top and comes with a very handy line guide (for those of us who can’t write straight without one!). 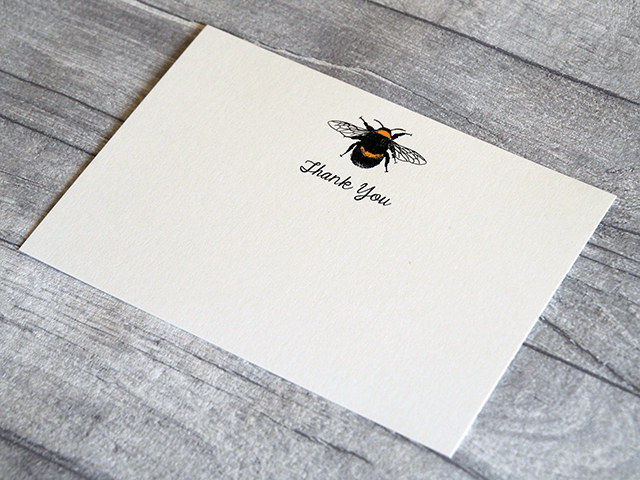 The thank you cards are a single sheet of 300gsm ivory card in A6 size, again with the bumble bee illustration at the top, but this time with the words “Thank You” in a handwriting font beneath it. 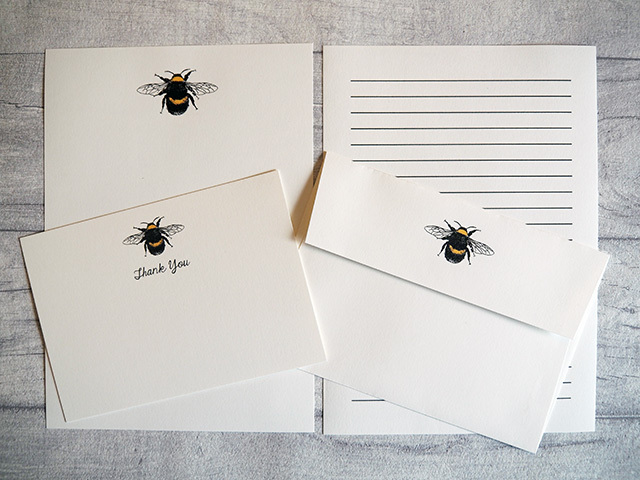 Both the writing paper and the thank you cards come with matching envelopes which have the bumble bee illustration on the flap. The paper and card used in the Wagtail Designs stationery are of a very good quality. It’s smooth and feels lovely to touch. Best of all, I found that I was able to use my fountain pens with this stationery with no issues at all (sometimes feathering and bleeding can be an issue when using fountain pen ink on certain types of paper). Mum bought me the Writing Paper Gift Set in a Luxury Leather Writing Case and chose the bumble bee design for the stationery, however, the writing paper and thank you cards can be bought separately. Wagtail Designs have a number of different illustrations to choose from, as well as various types of stationery available. I’m enjoying using this stationery for some of my letters, especially as it’s a bit different to my usual letter paper. I’m very tempted to get some more, but with a different illustration on. Do you have any favourite stationery? 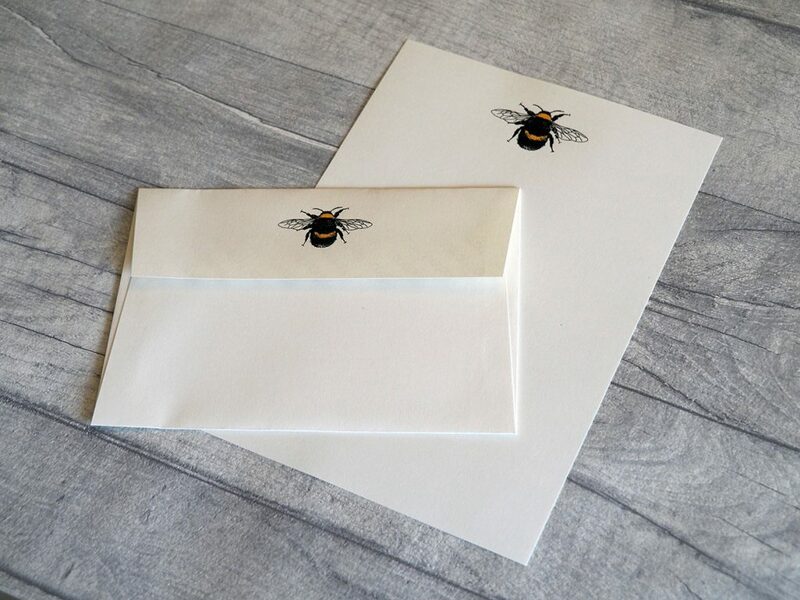 Tagged bumble bees, cards, letters, paper, stationery. 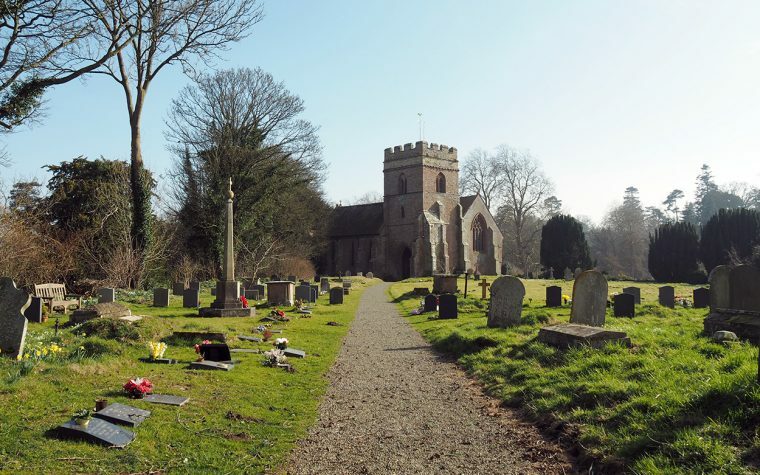 I work with someone who has a very similar small business she is hoping to build up over time, although Wagtail Designs are streets ahead of her right now in their lovely web presentation and diversity of products. I shall be giving her their site address as an example of the quality she should be hoping to achieve. The gift set looks lovely and I would certainly appreciate it as a present for any occasion. I particularly like that they offer the line guide as standard. I can remember when I was a child, it was only the then very expensive makers of writing pads and envelopes, such as Basildon Bond who provided the line guide. Letters always look so good on plain paper, but the thought of all those wavy and slanting lines of writing just makes me cringe! Very creative use of a little bee – very pretty! I do love that little bee design. Such bee-autiful stationery. Did you order? And yes, I did spot those 8 legged things! As much as I would like to, I’m managed to contain myself. I already spend enough at Field Notes! What a wonderful gift! It really is lovely — I adore the bees! As for me, I guess I mostly use the notecards I do myself but I can’t resist buying other fun cards I like! Thanks for popping over to the Gypsy this weekend! Always nice to see you! What a lovely present from your mom! I made some in a class one time I kind of liked but I prefer yours. Good quality paper stock and a simple but catchy design. Right now I’m trying to figure out something for a business card for when people ask me why I’m taking photos. The stationery looks so nice, I think those bees are very cute. What gorgeous stationary! 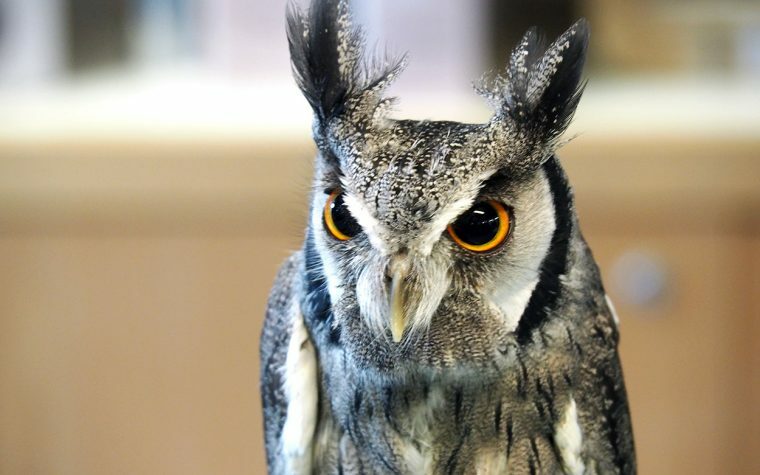 I will have to check out Wagtail Designs.